INDUSTRY.co.id - Bekasi - PT Jababeka Tbk in cooperation with PT PP Property Tbk to form a joint venture company under the name PT Jababeka PP Property. This joint venture presents a vertical dwelling or affordable apartment called Riverview Residence which presents its first tower called Tower Mahakam. The Mahakam Tower, whose builders have begun from December 2016, is now in its final stages marked by the top crown of the apartment. "The initial plan of this topping off will actually be done in December 2017, but because the development is faster than the time specified, we are the topping off," said President Director of PT Jababeka PP Property, Awanu Alfan last weekend. In the construction of the Mahakam Tower, PT Jababeka PP Property entrusted to PT PP Urban, a subsidiary of PT PP (Persero) Tbk as the contractor for the tower construction structure. "PT Jababeka PP Property is very concerned and committed to build residential Reverview Residence, the quality and results of PT PP must have no doubt in the construction of vertical buildings," said Awanu. Tower Mahakam became one of the dwelling that supported the program of one million homes promoted by the government by providing shelters for low-income people at affordable prices. Tower that has sold 90% of this comes with 19 floors that have 935 bedroom units consisting of 920 units of studio size and 15 units of occupancy with 2 bedrooms. The facilities of this Mahakam Tower include the Fitness Center, a commercial area that comes with shop and kiosk, ATM Center, and the owner of the apartment will have a certificate of ownership of Hak Milik Strata Title (SHMSRS). Having strategic access that is located right beside the exit toll KM 29 North Cikarang make Riverview Residence more easily accessible. In addition, there are other nearby toll access that is KM 31 West Cikarang. 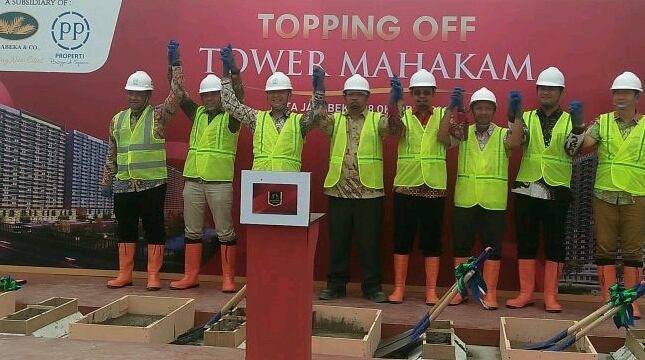 PT Jababeka PP Property targets the completion of the entire construction of the Mahakam Tower in the next year, whereby the plan to handover the Tower Mahakam unit to consumers is done starting in December of 2018.